Last week, we escaped for a few days to upstate New York and the Catskills Mountains. I love this area so much! 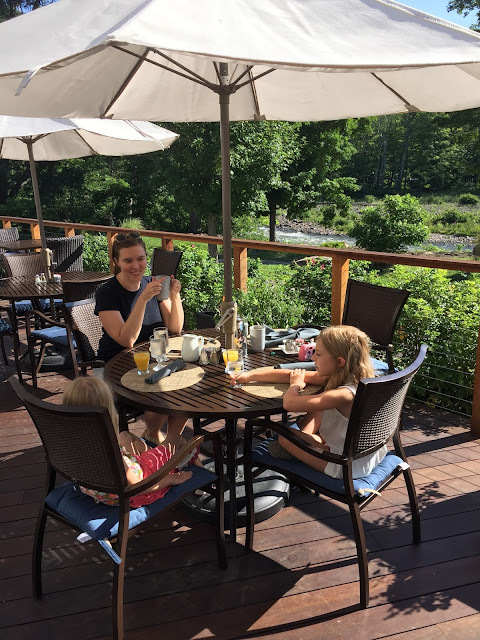 In two short hours from Manhattan, we found ourselves among the rolling countryside of Mount Tremper at The Emerson Resort and Spa. Its convenient location off Route 28 makes it a easy getaway for a girls weekend (their spa is currently under renovation and is going to be gorgeous when finished! ), a romantic babymoon getaway, or as we discovered, a relaxing family vacation. The girls settled in quickly to our Royal Suite room, complete with private balcony and a gorgeous bathroom with whirlpool bath and rain shower. Our room felt luxurious yet totally comfortable at the same time: the perfect combo. The Emerson has taken great care to appeal to families-- their activity field has lots of outdoor games (frisbee, volleyball, corn hole, horse shoes, badminton, etc.) and we visited the pool to cool off each afternoon. They also hold bonfires every weekend, with 'smores kits available at the front desk. Yum! If you're looking for more activity, bike rentals are available and guided hikes can be arranged. We had breakfast each morning at The Woodnotes Grill, which serves locally grown food in their beautiful dining room and outdoor deck. The first morning, I went with granola and Greek yogurt as I was taking a yoga class afterwards. Delicious! We have two little girls obsessed with chocolate chip pancakes, so the kitchen was able to specially add chocolate chips to their pancakes for them each day. The yoga class, by the way, was such a great way to start the day... why don't I do that more often again?? The Emerson is also home to the World's Largest Kaleidoscope. No, really! It was certified by the Guinness Book of World Records. 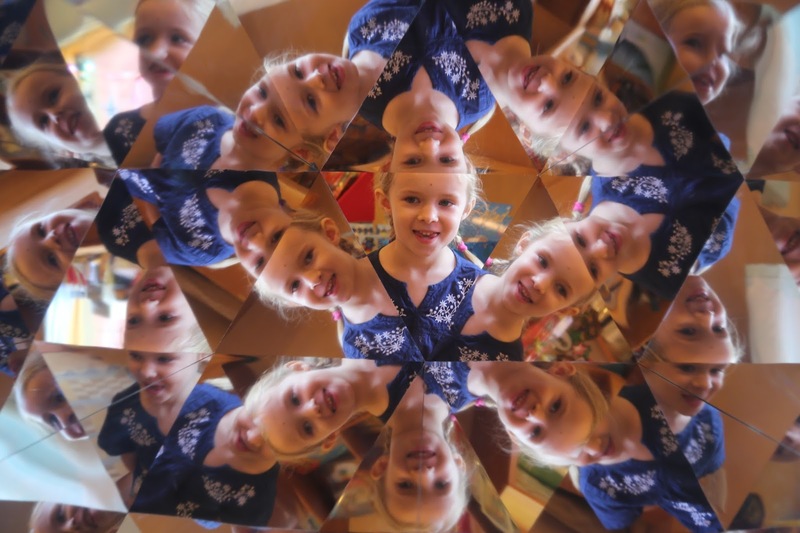 Built inside a silo on the property, hotel guests can view a beautiful display of moving images and mirrors designed by a kaleidoscope expert. Several themed shows set to music and narration are available to view; the one we saw was about the solar system. Quite stunning! After the show, there are several smaller kaleidoscopes to check out. Love the photo of Vivian... obviously we all had to have our picture taken in that one! During our stay, we had an opportunity to check out nearby Woodstock and Phoenicia (more photos coming in my next post). What a gorgeous area... it's amazing how fast the stress falls away when you leave the city! On our last night, we had fun with the Family Game Night basket, which included popcorn, games, puzzles and candy. Another added touch that makes The Emerson really stand out! Themed baskets for families, friends and couples are available for $30-$100, depending on what you choose. The Emerson really struck the perfect balance between being peaceful and relaxing, yet offering enough activities to keep our kids busy both at the resort and in the surrounding area. I look forward to going back in the future! Oh how lovely! Looks divine. The girls are getting so big. Glad you guys got away!